Cratejoy's Subscription Box Sunday is Nov. 26, 2017 and will feature a collection of discounted boxes just for the occasion. Cratejoy's Subscription Box Sunday is Nov. 26, 2017. This year, Cratejoy is launching Subscription Box Sunday, centered specifcally around subscription boxes, the Sunday after Thanksgiving (Nov. 26, 2017) as part of its holiday campaign. Cratejoy’s website will feature an exclusive Subscription Box Sunday collection with a number of deeply-discounted subscription boxes. Boxes in this collection reflect the diversity of boxes available on the Cratejoy Marketplace, ranging in themes from beauty to fandom and everything in between. 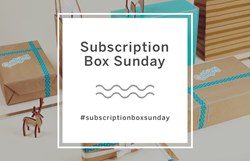 Media personnel, Cratejoy merchants, participants and box recipients are encouraged to use the hashtag #SubscriptionBoxSunday to promote the holiday. For more information about the Subscription Box Sunday collection that goes live on Nov. 26th, visit https://sell.cratejoy.com/blog/subscription-box-sunday/. To find out more about Cratejoy, visit https://www.cratejoy.com/. Cratejoy is a subscription box marketplace and the one-stop destination for all things subscription-related.